Water is in the air, so its in your compressed air. Depending on the temperature & humidity there will be either a lot or a little water, but it will always be there. Moisture in air lines will cause premature failure of your compressed air lines and your equipment. Water removal is done is stages. The first stage of water separation is the tank. (or in the rare case a belt guard after cooler) When compressed air comes out of the pump it is hot (~180°F) that means any water in the air is water vapor. The tank is room temperature so when that hot water vapor makes contact with the inside of the relatively cool tank, it condenses on the inside of the tank. In order to combat this you must drain the tank daily or install an electronic auto-drain. Stage 2 of water separation should be a mechanical separator – looks like an in-line air filter. What it does is provides some filtration but is designed to remove large liquid loads. Depending on the temperature of the air, this process will remove between 40% and 60% of the water in air lines. At this point the air may be dry enough for your operation. Install point-of-use filters with auto-drains at each station in order to catch the last remnants of water and dirt in the air lines before it reaches your tools. STAGE THREE: Refrigerated Air Dryer. The next stage is to cool the air coming from the compressor. Why cool the air? Because cold air can’t hold water. The colder the air the less water it holds. That is why the industry talks about the dew point. Dew point is the temperature of the air. There is a direct relationship between the temperature, pressure, and the moisture content of the air. 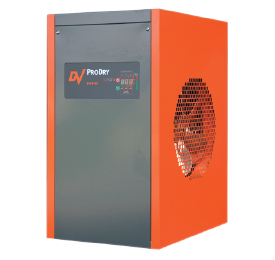 A refrigerated air dryer cools the air down to 3°C. It is basically a refrigerated coil mated with the air line. This removes the heat from the air line and cools the air in it. The water is diverted by gravity and removed with an electronic auto-drain. A pre-filter should be placed before the air dryer to protect it. 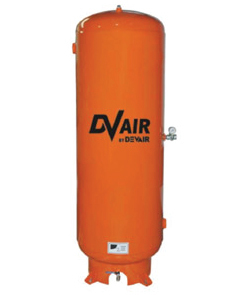 STAGE FOUR: Desiccant Bead Air Dryer. This stage of air drying and eliminating water in air lines takes the dew point down to -40°C (or -80C in special cases). This is very dry and is needed for painting, printing, and instruments (often reffered to as instrument air). The beads physically absorb the water in the compressed air, so the air must be relatively dry before entering or the beads will become loaded up with moisture very quickly and stop working. There is a moisture indicator on the front of this unit when it turns colour the desiccant beads need to be changed (should be 1 year or more). As you can see there are two air filters that come before the bead chamber – The first air filter takes out 5 micron, and bigger, particles and the other filter takes out any oil vapour and particles down to 0.01 microns. This level of filtration is necessary because if the beads get contaminated with dust or oil they will not absorb water and will prematurely fail. We pride ourselves on our ability to match our clients needs with the perfect compressed air system. Call 705-722-5747 Ext. 1 or use the form below.